Keyword positioning is the strategic placement of keywords within a web page or document to gain recognition or indicate primary focus within a page. The higher up in a document a keyword is placed, the more importance it gains. 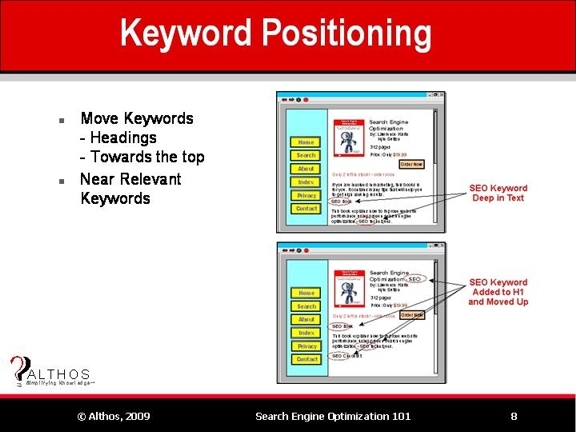 An example of keyword positioning is the placement of keywords in titles, headings or at the beginning of a web page. Keywords may be positioned near other relevant keywords to increase their value. For example, the keyword phrase search engine optimization may be placed close to search engine ranking algorithm to add keyword relevance value. This figure shows how keyword positioning can improve the web page value perceived by search engines. This example shows how the keyword “SEO” is located in the heading 1 title and how it has been moved up towards the top section of the web page.